Anyone else ready for warmer temps and all the fresh flavors? While I like chocolate, pumpkin, and spice I’m ready for all the lighter flavors that come with Spring, like lemon. 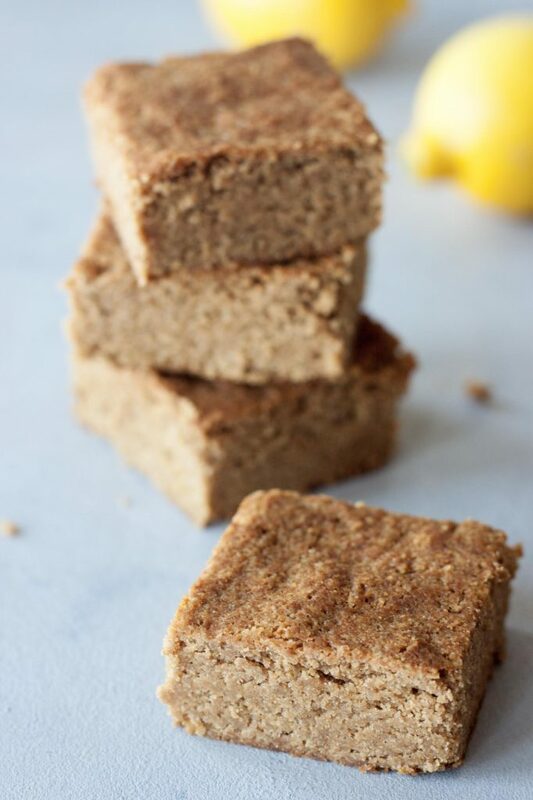 If you’re like me and craving them too I got delicious Grain Free Lemon Blondies you are going to love! 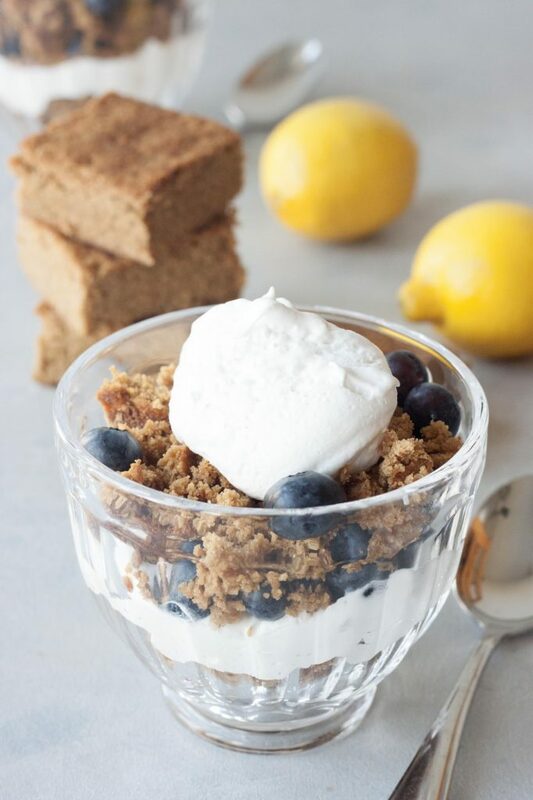 Even more exciting is if you are still looking for a dessert or treat for Easter or a springtime party you can make an easy Lemon Berry Blueberry Trifle using my Grain Free Lemon Blondies for a gluten free, grain free, vegan dessert that everyone will love! 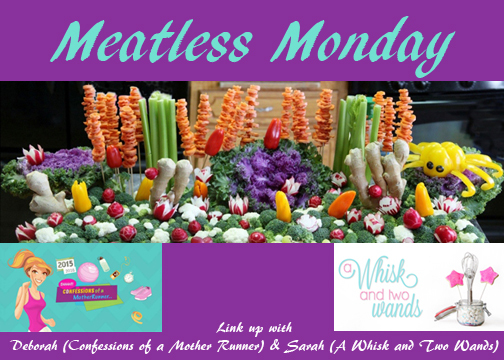 It’s Monday and once again my co-host Deborah and I have another Meatless Monday link-up below. While I’m excited for a new week, maybe a little more excited this week since I’m going to try to head back to barre tomorrow, I’m wishing I had one more weekend day like Saturday. Saturday was a beautiful warm spring day, no joke even though it was April Fools. We had a lot of stuff planned that day so we didn’t get to get out and enjoy it like we would have liked to. Yesterday of course was open and we would have dropped our laundry and to do list in a second to spend the day outside if it was like Saturday. Of course it was cold and sprinkled on and off. We still made it out with the puppies for a nice family walk which was nice. I wish that the weather got he memo it’s really spring and the flowers were blooming and the sun was shining daily. I’m going to sip my smoothies, spoon my smoothie bowls, and enjoy all the fresh fruits and veggies even if it is sitting in the sun shining through my window on a chilly spring day. 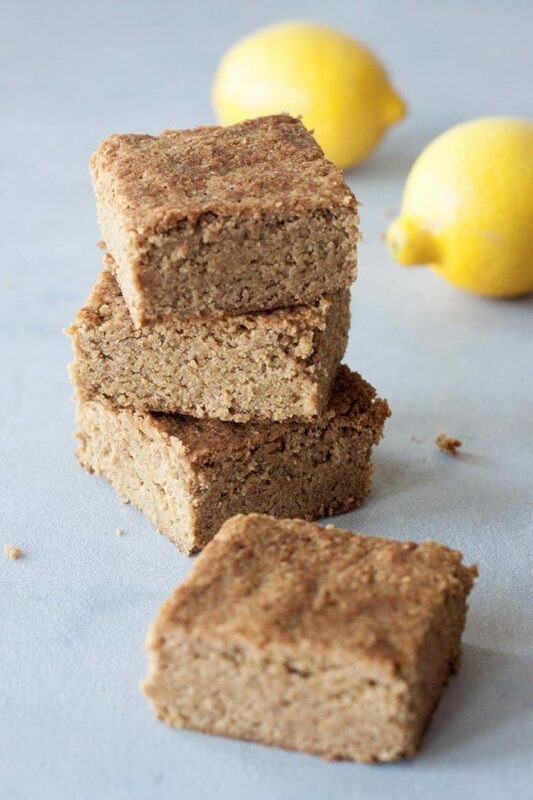 Now on to what you came here for, the Grain Free Lemon Blondies! These delicious blondies have more of a heavy blondie texture than a light cake texture, but aren’t fudgy like brownies. They are grain free, gluten free, vegan, and packed with lemon flavor! Perfect for a treat, brunch, snack, afternoon tea, or dessert. Other then the mmm, there isn’t much to say about them. They are just easy to make, allergen friendly, and versatile. The story would end there but while making another batch to photograph I was a little impatient. I was rushing because I had a small time slot that day to get them photographed with the light. This was a couple months ago when the days were really short and my window for photographing was very small. Things got a little off schedule that day and I didn’t let them set as long as they should have before cutting and I crumbled a few. I photographed them anyways as they were tested and I knew what I did and only crumbled two. After I was done I was hungry and ate a couple chunks and then got an amazing idea… yep this Lemon Blondie Blueberry Trifle just happened! So I ran to the kitchen, grabbed a clear bowl, and snapped away. It was just meant to be and I had hoped to make another one with raspberries as well but the berries, lighting, it just didn’t work the next day and then the pan was gone! Yes they disappeared from the fridge. The options are endless as these bars are delicious as is or made into a trifle with fresh berries, single serve using a bar or into a big trifle to share with guests at a dinner or party. 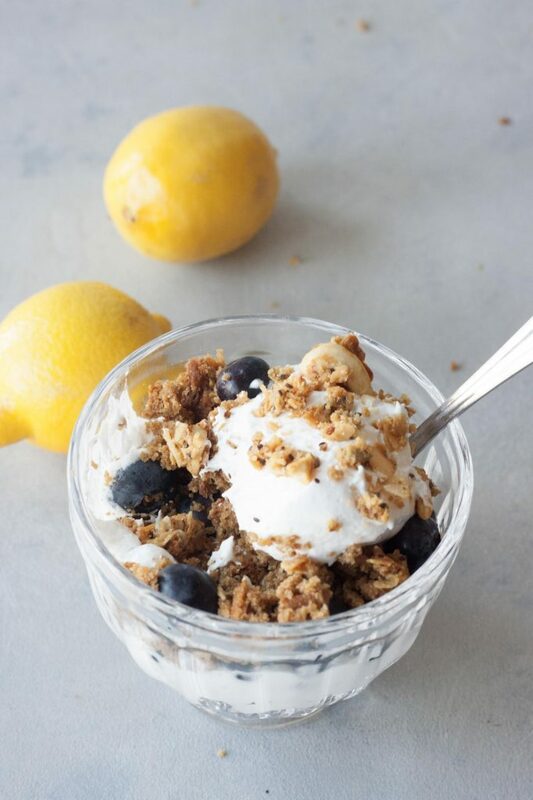 You can also use the bar in a parfait instead of a trifle subbing your favorite vanilla yogurt and I even like to add a few of my favorite WholeMe Lemon Berry Chia Clusters on top. This also just goes to show you that life is what you make of it and you can look at those crumbled bars as a fail or turn them into something spectacular! I have my off days and with recipe testing things don’t always go as planned. I often get cookies, bars, or baked goods that need tweaking and don’t like to throw things away so when they can they get used as something else. It doesn’t always happen that way but ice cream and smoothie bowls don’t care if the cookies on top are crumbled, they actually prefer it that way. I will also say there have always been times I’m making dessert for a party or guest and something doesn’t go as planned, like a cake that is not perfect. My husband will be the first to tell you that I am very critical of things in the kitchen especially if I’m making them for others and if they aren’t “perfect” you don’t want to be around me in the kitchen. I will often scramble to make it again but when that isn’t possible I have to get creative. Things often have a way of working out just fine. *You will want to make the Lemon Blondies 4 hours before assembling the trifle as they need to cool completely and chill. I like to serve this trifle within a few hours of making it. Start by pulling out all of your ingredients from the refrigerator, like yogurt and coconut milk, so it starts to come to room temp. Preheat oven to 350F. Line a 9×9 pan with parchment paper and set aside. In a large bowl mix together almond flour, coconut flour, baking powder, baking soda, and salt. In another bowl mix together coconut sugar, coconut yogurt, lemon juice, melted coconut oil, coconut milk, and lemon zest. Add the wet ingredients to the dry and mix until combine, careful not to overmix. Spread the mixture into the parchment paper lined pan. Bake for 30-32 minutes. Remove from the oven and let cool for 30-45 minutes before moving to the refrigerator to set, cool completely before cutting and serving. Enjoy! To make a single trifle or parfait layer ingredients in a dish as desired. To make a large Lemon Blondie Blueberry Trifle prepare your coconut cream, or remove frozen So Delicious Coco Whip from the freezer and let thaw as directed. Cut Lemon Blondies into 1″ squares or crumble and layer with whipped cream and fresh blueberries, I usually do 3 layers. Garnish with lemon zest and fresh blueberries if desired. Serve or store in the refrigerator until ready to enjoy. Like it? PIN it for later! Two pins, Grain Free Lemon Blondies and Lemon Blondie Blueberry Trifle. 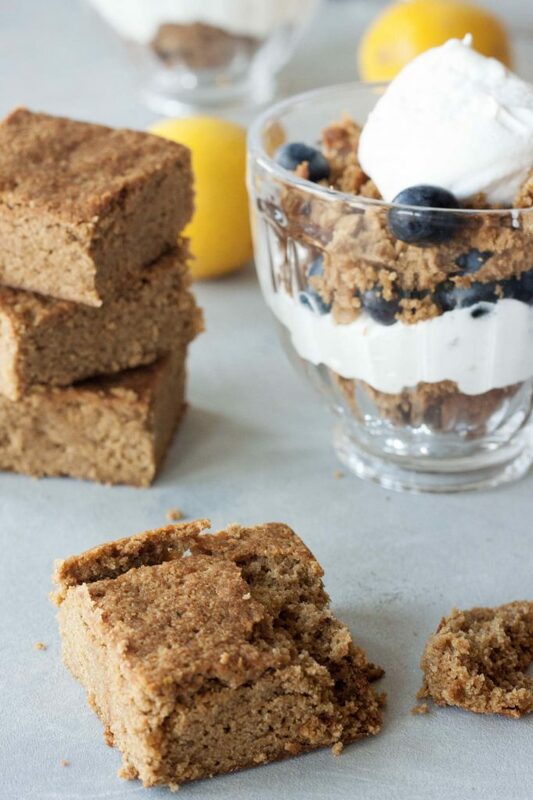 Delicious Grain Free Lemon Blondies can quickly and easily be turned into a vegan gluten free Lemon Blondie Blueberry Trifle for dessert. 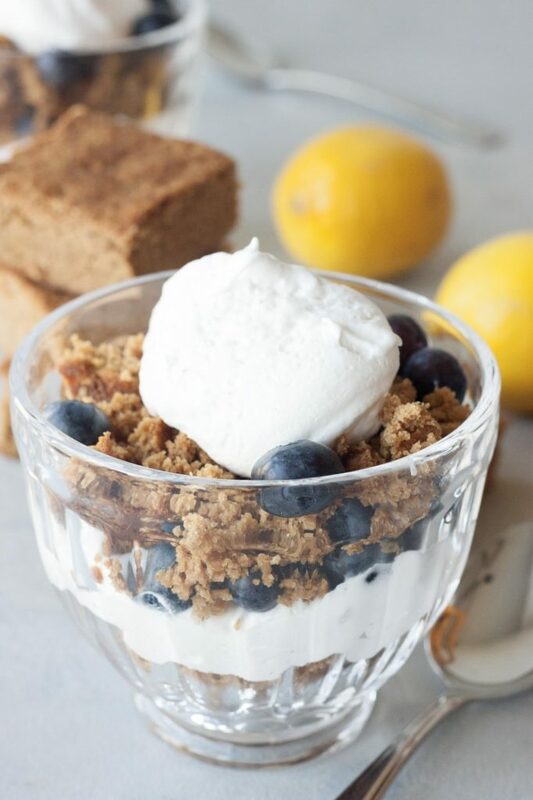 Delicious Lemon Blondie Blueberry Trifle is quick and easy not to mention gluten free, vegan, and paleo so all your guests can enjoy it! Thank you Deborah, their perfect for that transition. Oh nice! I love lemon baked goods! I like your grain free twist! I’m loving lemon so much lately, more then usually. Thank you, hope you enjoy them as much as we do! Keep me posted if you make them. That trifle looks ah-mazing! I’m a big fan of the lemon-blueberry combo together in things like pancakes, so I know I’d love it in a dessert like this too. Can’t wait to try it. Lemon blueberry pancakes sound so good right now! I hope you love it as much as we do. Trifles are one of my favorite desserts. They are so fun and so easy. And the combinations are endless. Thanks for giving me another option to try! This is a beautiful and simple recipe Sara! I love all the quality ingredients! Pinning! I hope you love them as much as we do, keep me posted! The bars and the dessert look really yummy! My family will love them. I’ve never tried any type of coconut sugar, though I keep seeing it in recipes. Thanks! You could sub regular sugar if you want. Coconut sugar has half the glycemic index of cane sugar so it it’s lower on the glycemic index. It also contains potassium, magnesium, zinc, iron and B vitamins. You can pretty much get it anywhere these days, Whole Foods, Target, Trader Joe’s, Costco, online. How much fun are these blondies! They look so tasty and delicious. Thanks for hosting too! Thank you Julie and thank you for linking up with us! These blondies do look so moist! And that trifle looks delicious too! These both are a must make! Thank you Taylor, I hope you enjoy them as much as we do. Thank you. Right those winter days are hand and draining trying to fit everything and work with Mother Nature. The blondies look yummy alone and even better in the trifle. Do you bake and deliver? this is such a creative way to healthy triffle! Thank you Emily. It’s such a simply delicious combo isn’t it? I hope you enjoy them as much as we do. We all have those days where we feel like there’s not enough time to get everything accomplished. Those lemon blondies look amazing though! These bars look incredible! Totally my style!